One of many models – Here is a self-contained shelf mounted model…. for in-isle, nose level display in Supermarkets. Size: Approx. 2″ X 4″ by less than 14″ depth. This one is optimized for a beam distance of 1′ – 8′ – although much further distances are possible. MultiSensory Systems, Inc. realized an opportunity extend our aroma diffusion technology into an exciting new, mass market environment… for “scent-branding” purposes, based upon our patented AromaComposerTM technology. Scent-marketing experts are impressed with our ability to direct a narrow focused scent-stream a programmable distance to a specifically targeted “human potential market Unit” using, using trace amounts of essential oil. MSS has produced a prototype of a specialized scent-marketing device, along with two development tools. Together they enable us to produce a product line based upon modular components, with each model designed for a particular situation or environment. Many models will be sensor activated. An automated “SMART” version has been fabricated. Nozzles are very specific for each product use and sensitive to fan pressure and speed. They can be changed in a few seconds due to standard thread built into exit port. It’s a Smart System with Multiple Sensors…and it’s Totally Programmable: Each system is initially programmed for the site, the particular scent (essence qualities including volatility and other characteristics), and its specific application. Smart system readjusts all settings automatically for optimum performance. Two-stage system: Our patented two-stage diffusion system lends itself to separate control of the scent’s density (Stage 1), and of the systems airflow qualities, which include the scent beam’s length, spread and velocity (Stage 2). This makes all of this SMART stuff possible. Sensors bring Awareness – Left, right, and center: Multiple sensors send data to a programmed micro-controller. The system senses customers ahead of time, and the smart program adjusts internal devices constantly to achieve a perfect level of scent, as customers arrive near the product. Beam and density automatically vary according to the position and distance of shopper from the product, so as not to overpower a nearby shopper, or neglect one at a distance. 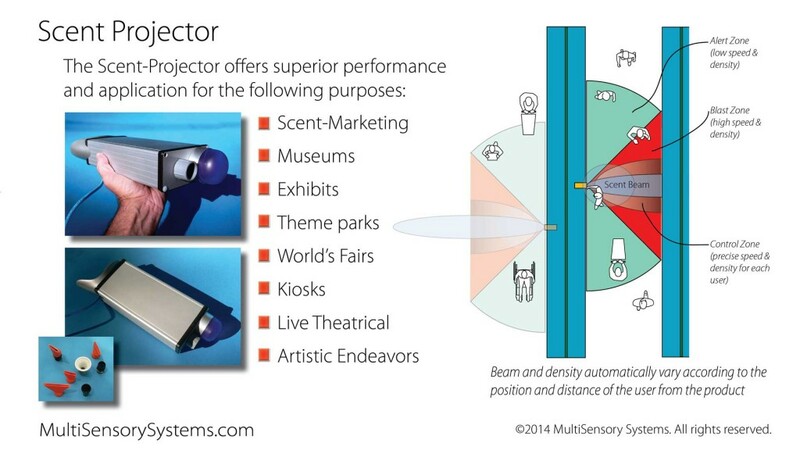 Precision Targeting: “Multisensory Systems” has patented various aroma diffusion and projection technologies that target users precisely, directing scent molecules to­ward the nose of a customer, rather than filling a broad space. Maintains “Brand Identity”: This narrow beam of scent avoids the unpredictable mix of nearby brands and scents with each other. Scent Identity remains pure and intense for intended customer only. Associates your product with your brand. In addition, this prevents conflicts; you do not go way beyond your contracted shelf space. Essential Oils: Our system was designed to make the best use of volatile essential oils, although other “fragrant material formulations” will also function just as well. Essence Efficient: Uses much less oil than traditional diffusers (superior essential oils are very expensive). Thus, high quality essences are now affordable. Clean: Leaves virtually no residue or lingering scent. Preservation of Freshness: Essence container(s) automatically seal tight when not active, helping to extend the life of oils and other scent retaining/diffusing substances. Minimizing Fade and Flatness: Program automatically recalibrates scent density settings over time, compensating for the hours of use, minimizing essence fade and flatness. Quiet Operation: System is inherently quiet. Due to its ability to sense a customer’s distance, it gets even quieter as the customer gets nearer to it.